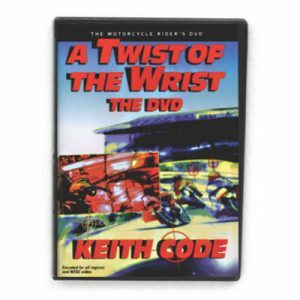 Essential for all motorcyclists from weekend riders to racers, Twist of the Wrist II brings Keith Code’s best selling book vividly to life, demonstrating precision techniques for overcoming barriers to cornering such as rider input, fundamentals on steering, visual skills, braking, body position, throttle control and more. From canyon roads to track, techniques are fully explored and laid out using multiple camera angles, onboard shots and CG animation in over 105 minutes of spectacular Hi-Def footage. 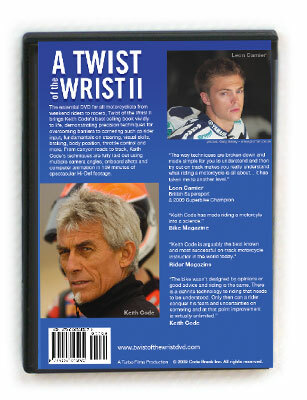 The best performance upgrade for any rider, Twist of the Wrist II is the latest product from Keith Code, founder of The California Superbike School and trainer of numerous championship winning riders worldwide.